If you’re in Hawai’i and you haven’t seen a rainbow or heard someone greet you with “aloha”, you haven’t been paying attention. These two details are common characteristics of the islands and, after a brief four-day visit to paradise, I’ve learned there is a great deal more to life in Hawai’i. To start, there is hardly ever a disappointing view. From the towering mountain ranges to the crystal clear turquoise waters, beauty surrounds you. 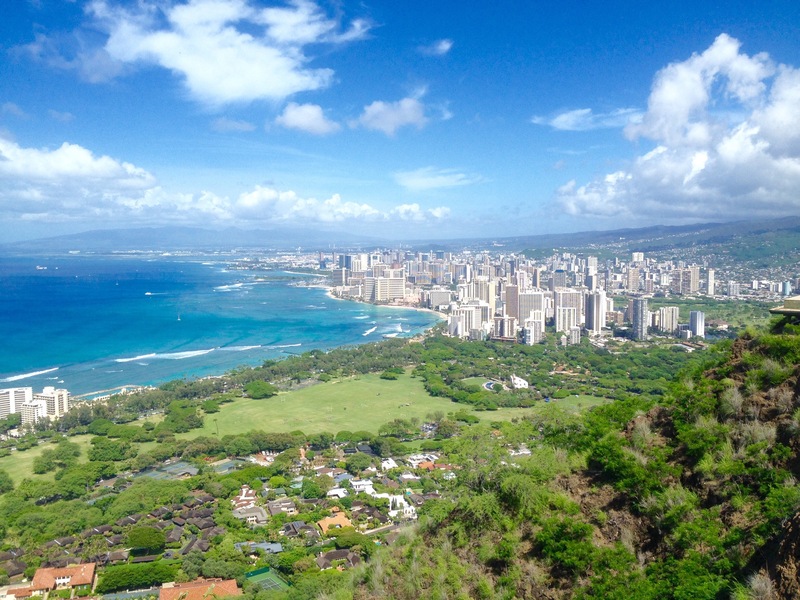 Because this trip was a planned stopover before reaching Australia, I spent all of my days on the island of Oahu, home to Honolulu, Pipeline, and the famed-Waikiki beaches. 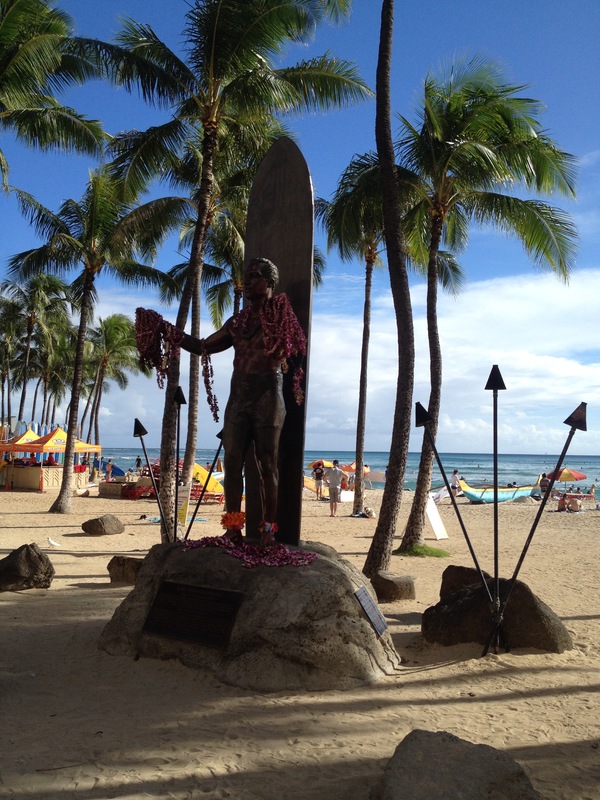 I chose to stay in Waikiki as it seemed the most convenient for my short stay. 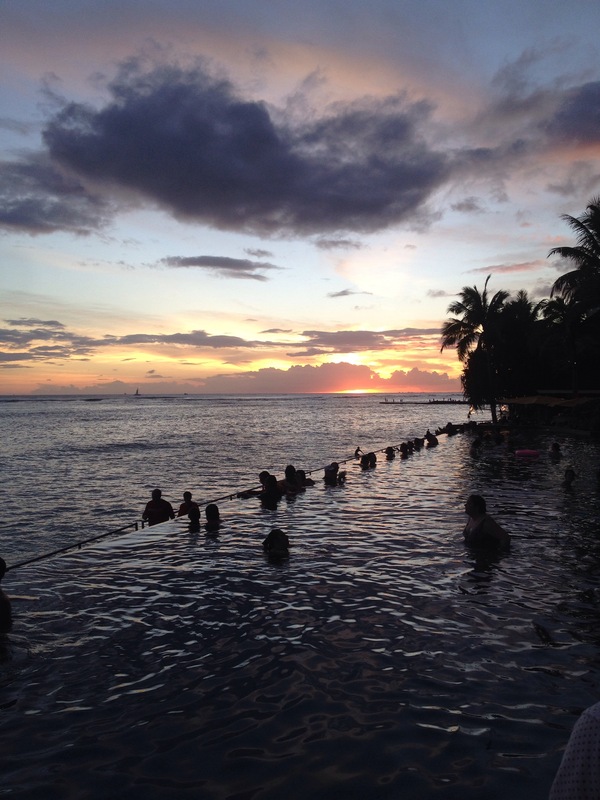 Waikiki is a popular tourist destination, and the part of the island locals often avoid. I spent a portion of a day exploring the area and was ready to see what else the island had to offer. 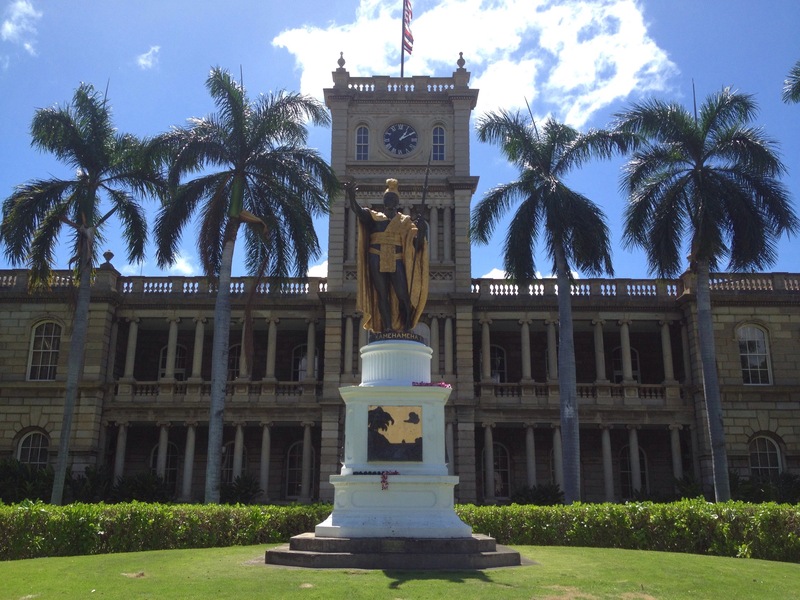 If you’re like me and you enjoy seeing both the tourist and “real” parts of a city/town/country, then make time to explore outside of Waikiki, too. Eggs n’ Things: Egg-cellent breakfast spot (see what I did there?!) with fresh ingredients and a lengthy line out the door. There aren’t many tables at the Waikiki beach location so be prepared to wait in line to order, wait in line to pay, and wait in line one more time for a seat. If you’re patient and comfortable operating on island time, it is worth the wait. I took advantage of the shared table option and was seated with a lovely couple from Arizona on a Hawaiian vacation. I ordered the Portugese Sausage and Scarmbled Eggs with Green Onions. It was delicious! Rum Fire & Shore Bird – Beachside bars with killer ocean views and wallet-friendly happy hours. I tossed down 3 Mai-Tais at Shore Bird for $4 each and woke up with a not-so-friendly hangover headache the next morning. No regrets! 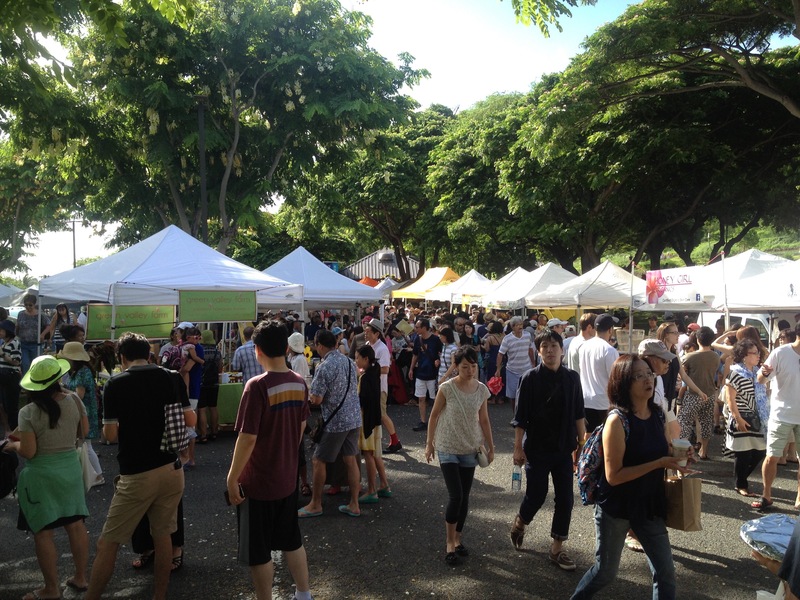 The Saturday Farmers’ Market at Kapiolani Community College – Farm-fresh and locally sourced vendors from all around the island come together at KCC every Saturday to sell produce, share their products, and serve delicious food. I stopped here for breakfast on my way to Diamond Head. Visiting farmers’ markets is one of my favorite things to do when traveling. I love to join in with the community in support of their farmers and local businesses. 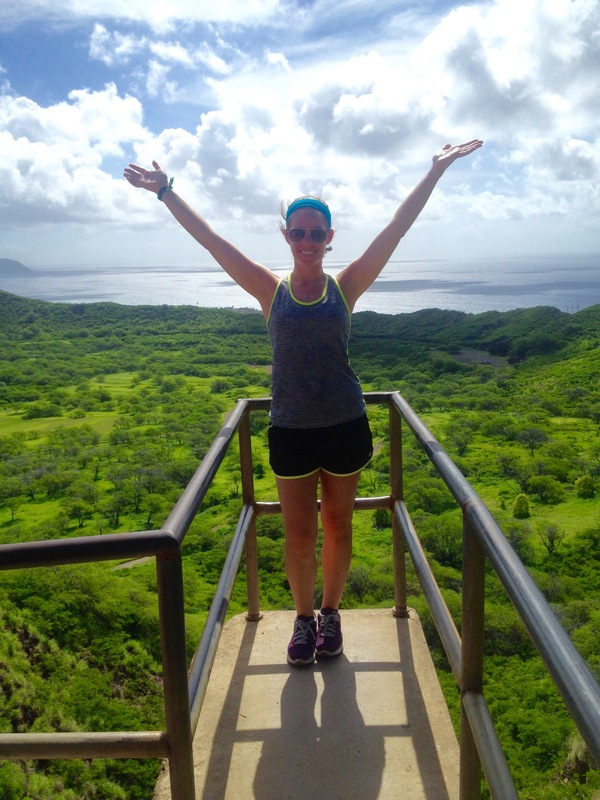 Hiking Diamond Head – A must-do hike located just over a mile from the beaches of Waikiki. The hike is well-marked with a series of uphill steps, gravel paths, a tunnel, and railings that line the whole trail. I did the hike on a Saturday and was surrounded by people going in both directions for the entirety of the hike. While I’m not sure if weekdays are less crowded, the volume of fellow hikers didn’t effect my overall enjoyment of the Saturday hike. How could they? With stunning 360-degree views of the island and Pacific Ocean, it’s difficult to feel anything other than awe. Hard to find a better view than this! Pig and the Lady – My first stop in town; a popular Vietnamese restaurant located just outside of Chinatown. After reading excellent reviews and listening to locals rave about the food, I ventured over there Friday evening for dinner. Being solo, I chose a seat at the bar and ordered the best pho of my life. I selected the farmers market pho and a few raw oysters, a special for the evening. The broth was deliciously flavorful and the vegetables perfectly paired. With the addition of a glass of wine and a friendly bartender, it was a memorable evening. One of the hotels along the beach features a fireworks display every Friday evening at 7:30pm, which was exactly when I was leaving the restaurant. As I walked outside, I headed down the block for a better view of the colorful skies. Another beautiful night in a paradise. 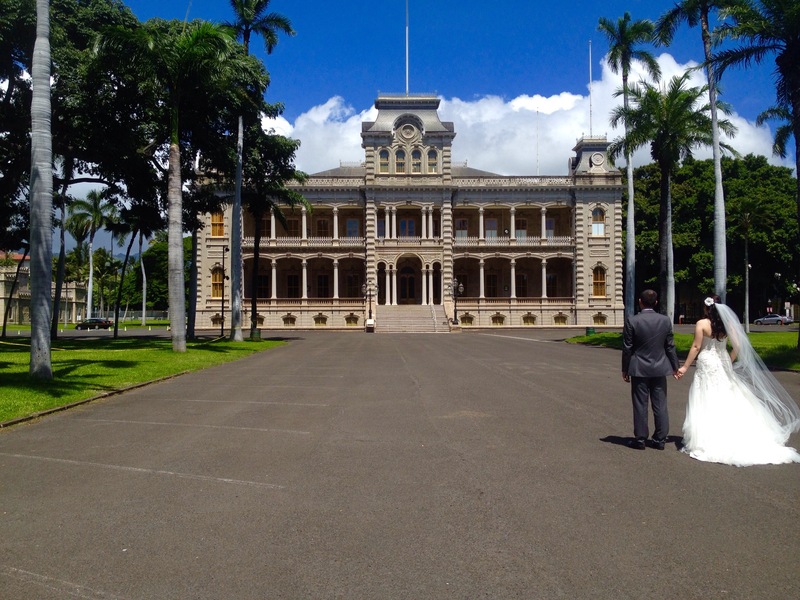 Pearl Harbor – While not exactly in Honolulu, a trip to Pearl Harbor is a necessary stop for any visitor. I reserved a 9am ticket online and purchased an audio tour for Sunday morning. Knowing that tickets need to be picked up an hour before the reserved time, I gave myself almost 90-minutes to travel via The Bus. This was not enough. The bus ride took significantly longer than expected and left me stressed upon arrival. Thankfully, I wasn’t visiting during “busy season” and my ticket was still available. I shared my misadventure with the ticketing agent and she sympathetically told me to call Reliable Shuttle for my return trip. If I could do it again, I would use this shuttle service round trip as it wasn’t much more expensive and certainly saves on time and stress. After checking in, my morning was spent walking through the beautiful memorial, listening to first-hand accounts and a guided tour of the sights via the audio set. 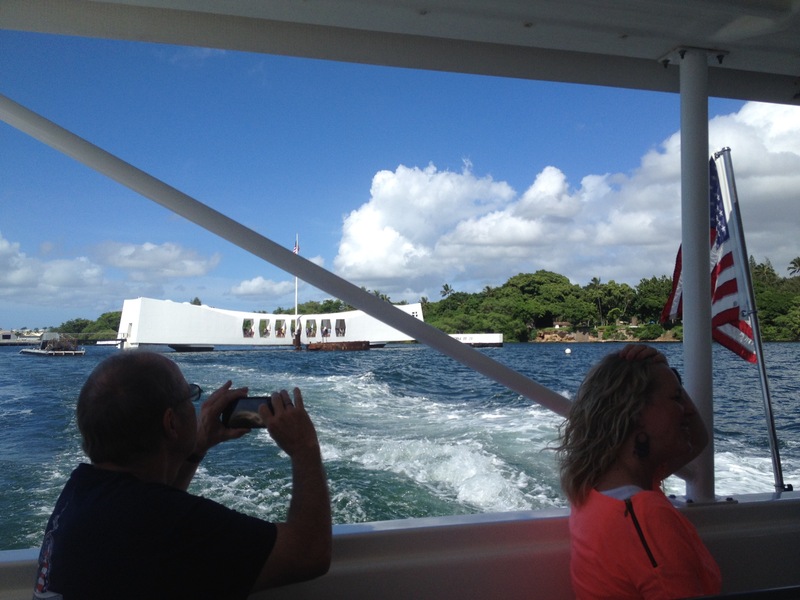 It’s free to explore the exhibits and visit the USS Arizona, which includes a 25-minute film and a boat ride out to the floating memorial. 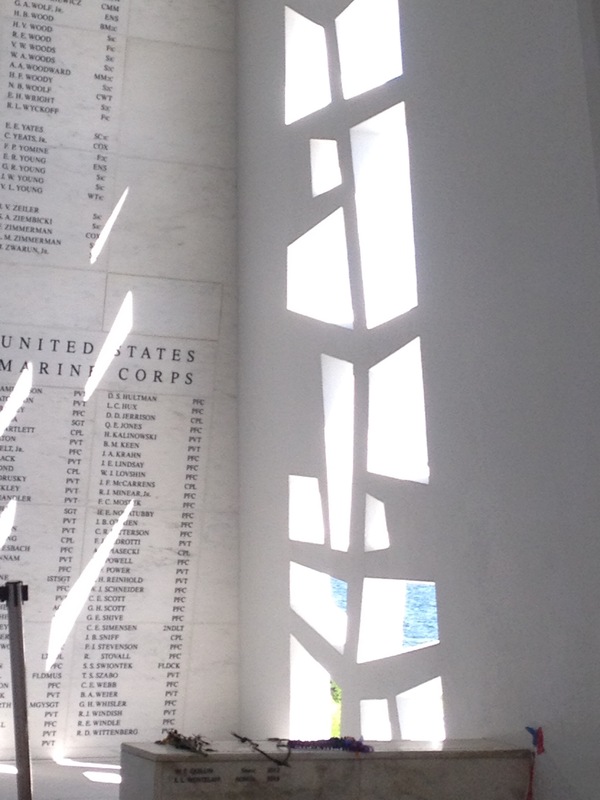 The inspirational and sobering memorial sits directly over the still-sunken USS Arizona, a watery tomb for many of those who died that fateful December day. A full list of names is posted along one of the walls, allowing visitors the chance to begin to comprehend the significant events of the attack. One of the things I enjoyed most was that the memorial provided opportunities to reflect on the impact and reasons for the attack as well as offer peace and forgiveness for the attckers. A section of the exhibit showcases the racial mistreatment of Japanese-Americans in the years that followed as well. 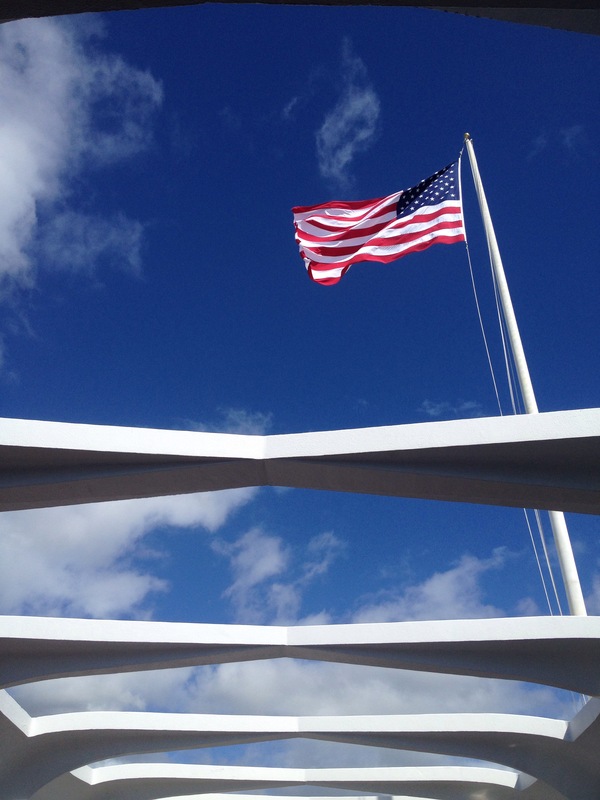 Overall, the memorial was beautifully done and a must-see for everyone who visits the island. 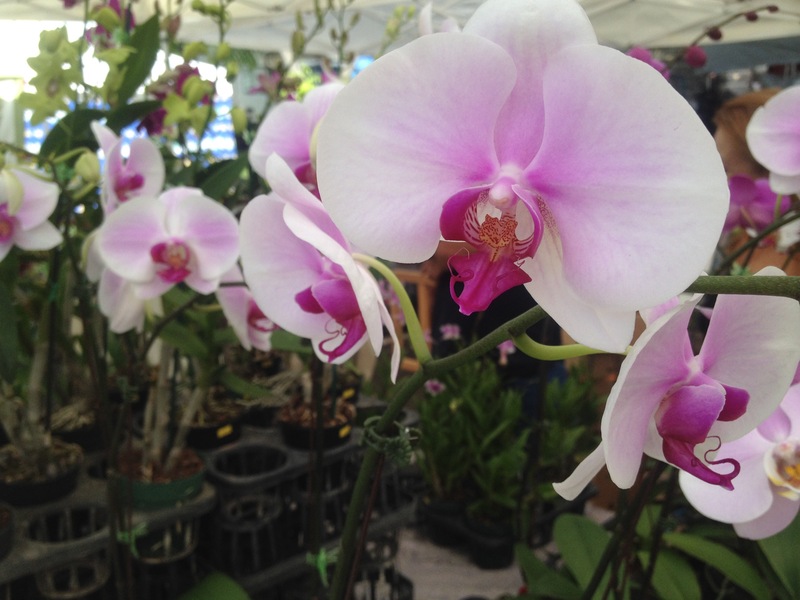 Exploring Chinatown – After my morning of rememberance at Pearl Harbor, I headed back to town to explore the Chinatown markets. Safer to explore during the day, the markets are filled with fresh produce and meats along with a variety of your typical Chinatown tourist merchandise. I browsed the markets, wandered along the streets, and popped into a noodle shop for lunch. While this wasn’t my favorite activity of the trip, Chinatown is worth venturing through when exploring Honolulu. Aloha Tower Observation Deck – Honolulu’s downtown isn’t very busy during the weekends, with much of the space used for business. 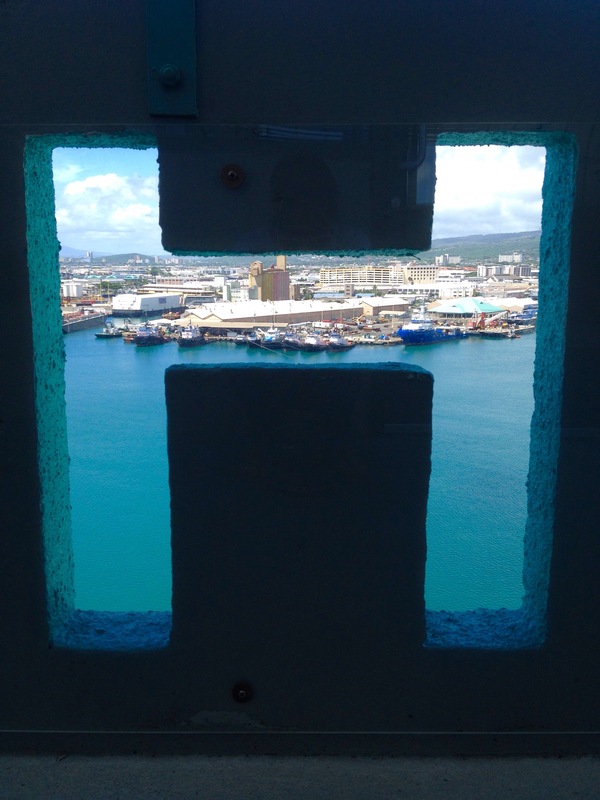 I was cruising around on a Sunday and ventured over to the Aloha Tower, barely seeing another person the whole time. The tower is about 14 stories high and offers an excellent view of the city and ocean. It’s free to take the elevator up to the observation deck and provides a nice breeze on a hot day. 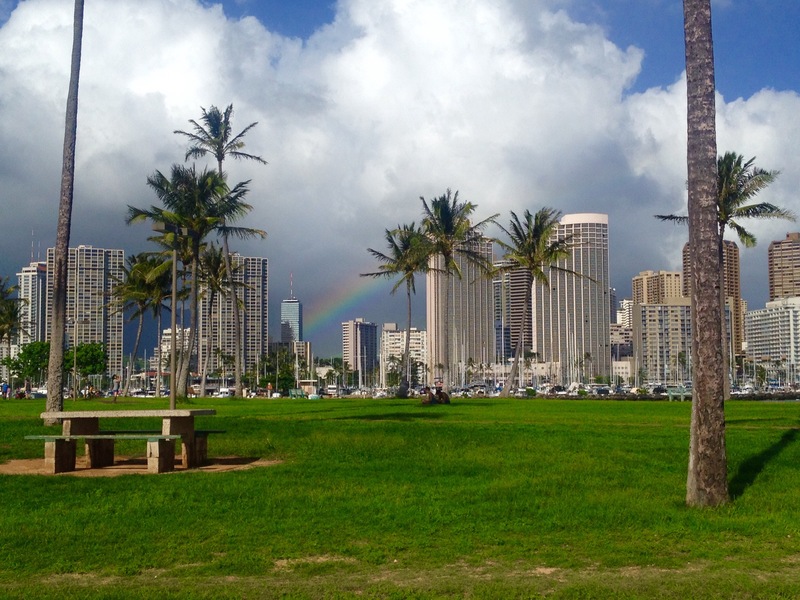 I had a great view of a rainbow from here as well, a common and welcomed sight in Hawai’i. Magic Island – After walking around downtown for a while, I was hot and ready for some beach time. I had glimpsed a little piece of land jetting out from the downtown area and decided to check it out. As you walk toward the water, you cross through a park with picnic tables, playgrounds, and a lot of open space for impromptu sports games. On this particular Sunday, several families were set up around the area for barbecues and even a few weddings. At the end of the land is a small inlet that’s protected by rock formations. Waves crash over the rock wall and, by the time they reach the shoreline, they’ve created a smooth sea and relaxing place to swim. I loved spending an hour here laying on the sand and swimming in the clear, perfectly temperatured ocean. Ala Moana Center & Alan Wong’s Pineapple Room – There are two large shopping centers in Honolulu with hundreds of top end stores, the perfect haven for the shopping addicts. While not much of a shopper myself, I walked through both the Royal Hawaiian Center and the Ala Moana Center to explore the area. I had also read about famed local chef, Alan Wong’s, more-reasonably priced restaurant in the Ala Moana center called The Pineapple Room; I had to check it out. 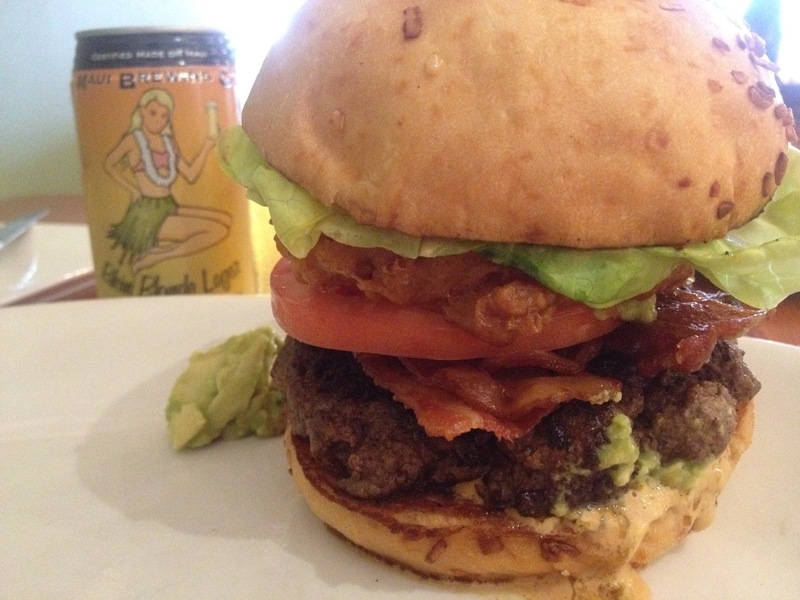 I ordered the signature burger with bacon, avocado, onion rings and a chipotle mayo and a local brew to wash it down. It did not disappoint. Breakfast at Ted’s Bakery – I’ve often found online reviews and travel blogs to be the most helpful when planning for a trip. There have been many occasions where I’ve enjoyed a suggestion from a friend or stranger. However, I also try to keep in mind that not every recommendation is a great one, especially when it comes to food. Unfortunately for me, Ted’s Bakery was one of those not so great suggestions. I decided to stop there for breakfast upon reaching the North Shore and ordered a breakfast sandwich and pastry. While it wasn’t terrible, it certainly wasn’t anything to write home about either. It seemed more of a tourist trap than anything, but it served its purpose in fueling me with something to eat before my day of exploration. Giovanni’s Shrimp Truck – Another famous Northshore characteristic is the shrimp trucks that populate the town of Halewei. After asking locals for their recommendations, I selected Giovanni’s as my lunch pick. Giovanni’s resides in a lot filled with other food trucks and picnic tables for your dining pleasure. Upon first impression, I wondered if the truck would pass a health inspection as it looked old, dirty, and was surrounded by flies and fighting roosters. However, I decided to trust what I’d heard and ordered a half plate of garlic shrimp with lemon and rice. And boy, was I pleased. For $6.50, I enjoyed a fabulous (and a bit messy) lunch which lived up to its hype. Beaches! Beaches! Beaches! 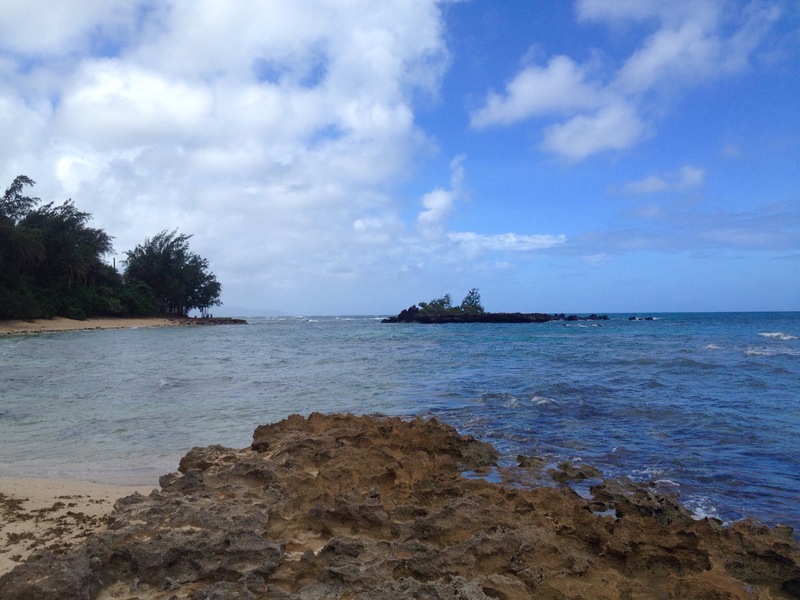 – Driving around the Northshore is difficult because there are so many beautiful beaches to gawk at. Several times I had to remind myself to keep my eyes on the road instead of starring over to the turquoise waters and gently crashing waves along the drive. There are so many beautiful beaches and easily accessible parking that it’s difficult to choose just one. My advice? Don’t! My favorite part of the visit was beach hopping from one to the next. 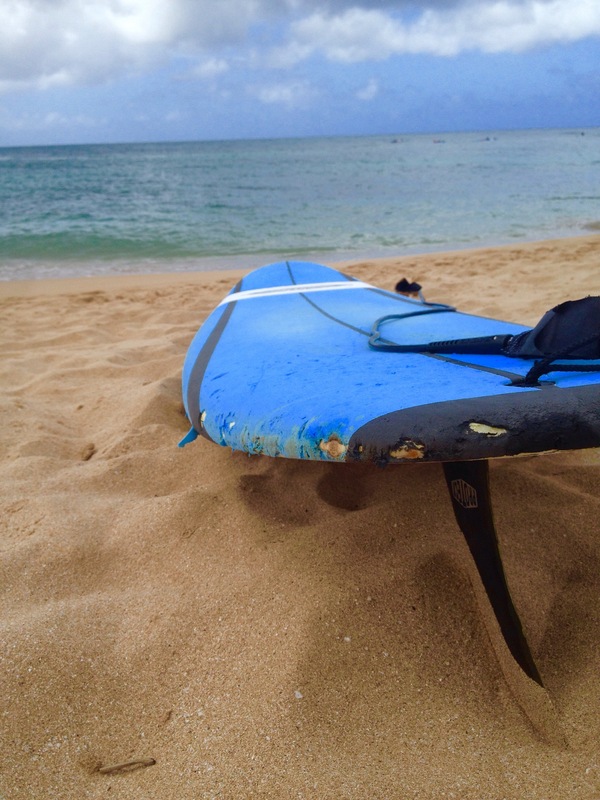 I spent the longest time on one beach in particular that offered visitors surf lessons. While I didn’t partake myself, I enjoyed watching children and adults alike learn to surf. 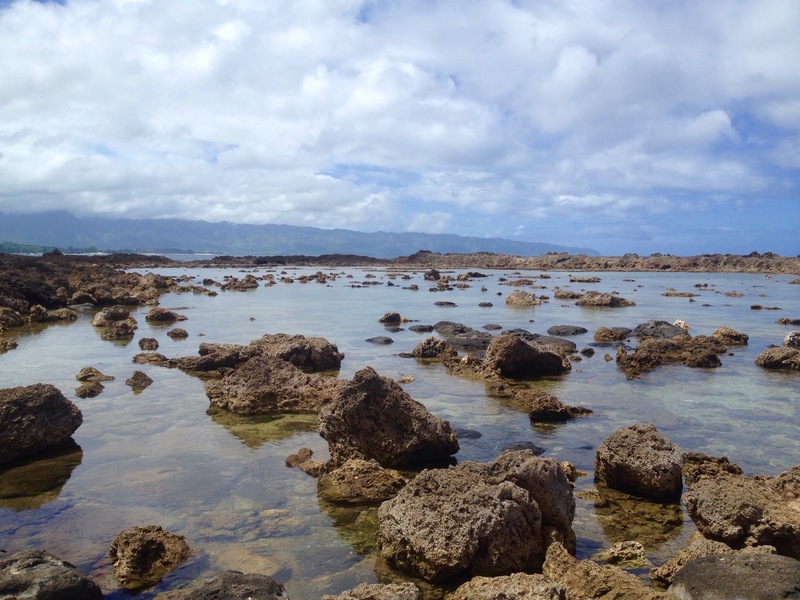 A few yards out from shore was a collection of small rocks and reefs dotting the ocean close to shore. As I starred out to sea, I saw a green sea turtle cruising along the rocks, popping its head up from time to time directly in front of me. It was one of the coolest things I witnessed all day. Snorkeling Shark’s Cove – Another gorgeous spot on the Northshore is Shark’s Cove, a shallow pool of rocks and tropical fish just waiting to be explored. I threw on my googles and floated along the top of the water, admiring all the colorful tropical fish around me. The Cove also offers the opportunity to scuba dive as well, swimming further out into the ocean for deeper dives. Don’t forget about sunscreen! It’s easy to burn your back while snorkeling. 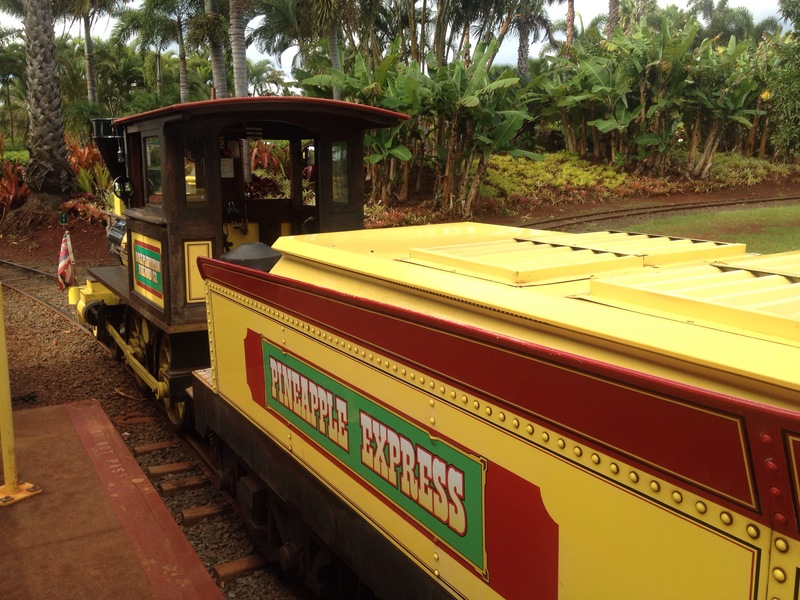 Riding the Pineapple Express – My last stop on the Northshore was the Dole Pineapple plantation. 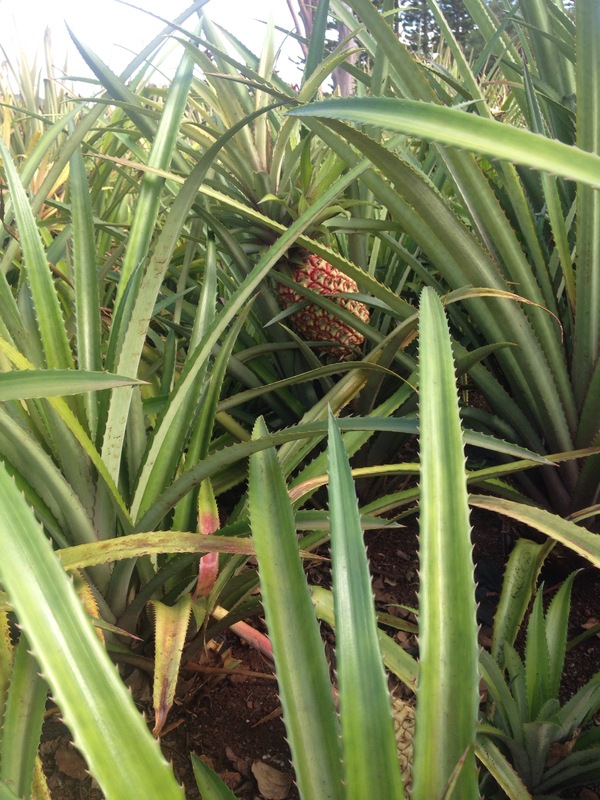 Visitors can learn about the history of the plantation and the tropical fruit, sample pineapple ice cream, get lost in the world’s largest maze, and take a ride on the Pineapple Express. Although it looks like a kid’s ride, the plantation sells ticket to ride the train along the property, viewing the crops, and learning about the harvest process. All in all, a delightful end to the day and my adventures in Hawai’i. Mahalo, Hawai’i! On to Australia! Ali, you were busy in Hawaii! Thanks for the tour. It does look beautiful there.